I have upgraded the package itself to v5.01. I have set the dev and peer dependency to be ^5.0.0, where appropriate. This version contains new rules, some of which have been used in the config above, therefore it will error out with earlier versions of the plugin. Finally, I added a section to the documentation of eslint-config-react-app indicating the rules that have been activated and how you can override them to run the full set. I have done a clean install of packages, and also started the React application with clean slate as well as error situations and all function as I would expect. I hope I have not missed anything. 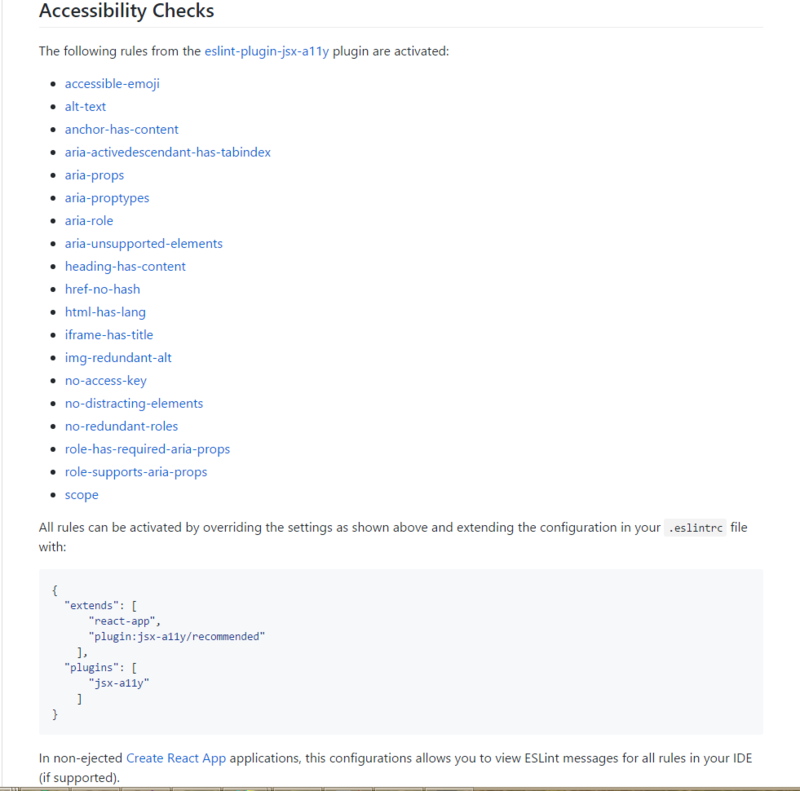 ESLint Config: Upgrade eslint-plugin-jsx-a11y and activate more rules. This looks great, thanks! I removed html-has-lang because people don't really use <html> inside client-side React apps. @gaearon Awesome! Thank you for caring! We are working on getting 1.0 out but we never suggested using CRA with Airbnb config and don't officially support this. In fact I would discourage it because Airbnb is heavy on style rules, for which I suggest using Prettier instead. It’s fine if you do it, but there will be more issues like this, and unfortunately we can’t adjust our releases based on Airbnb releases. But yea, it is coming soon. Thank you! Yeah I'm definitely not asking on being in sync with airbnb and totally agree that it's my choice of using it or not. Looking forward for the next release.